Hammered metal discs add a sculptured element to these trendy earrings. Add the Dot of your choice to match your outfit for a very coodinated style. Sometimes simple is the best classic and that's definitely true for the Firenze Earrings. You can pair this with the gorgeous Firenze Necklace and have a winning combination that goes with any look. Plus, if you're like me and have rings in both metallics (gold and silver), jewelry that combines both gives you the best of both worlds. All for that totally fashion-forward, pulled together feeling. I LOVE these earrings!! They are so easy, with lightweight posts that make you look fabulous!! Dainty fun design matches all your accessories. Cannot go wrong with these! 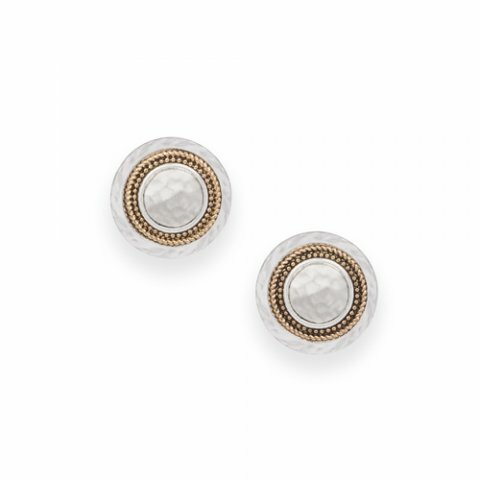 Great size earrings for an everyday look to go with every outfit! Love the hammered silver with the gold roping detail to give a textured look. The perfect compliment to the necklace. Simple but classic. Very comfortable. These mixed metal earrings are light weight to wear and eye appealing! Amazing earrings! They are perfect for everything... match your outfit, dressy or casual. They are so lightweight you don't notice you are even wearing earrings. These are fun earrings for an every day casual look. I love that they have both Gold & Silver so that you can pair them with many other Style Dots Foundation Pieces. I love that I don't need a Dot with these earrings!